View cart “Vocational Astrology” has been added to your cart. Introduction to Business Astrology was recently presented in Australia to a very savvy group of financial and business astrologers working in the real world of money and finance. 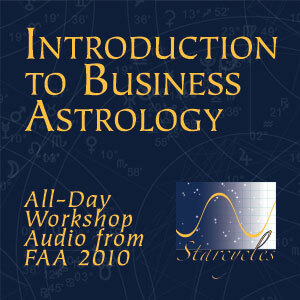 The differences between business and financial astrology. The various houses and their meanings in incorporation charts. Analysis of each house using a corporate template, using a major corporation’s data. Electional charts for starting businesses – what is good, what isn’t. Solar Arc timing for predictions regarding personal or business decisions. The use of eclipses in timing for either individual or business charts.